As a programmer of ENCOM, the famous high tech company that specialized in 3D temporal scanning and other reconstruction systems, you got worried by the disappearance of some of you collegues yesterday. Tracking them down, you finaly arrive at the 3D scanner console and recognize on the desk the ballpoint pen of Flynn, the ex-genius of the company that got laid out last year after he got some hard words with Dilliger the current boss of the company. Trying to figure out what happens, you simply decide to log on the console and check for any trace of what Flynn was trying to do there. You are so preoccupied by the endless stream of data that moves through the screen that you do not notice the movement behind you: Directly in your back is the complicated system that is used to scan items in 3D. The lens cover slides down, and brief impulses of light starts to shine around the head of the laser canon while a small buzzing noise starts coming from the energy amplifier begin to be audible. Suddenly noticing that something is wrong, you turn your head toward the noise, but at this moment all the energy stored in the generators is expulsed and concentrated in the laser beam that meticulously starts by cutting you down in pieces of atomic scale. Few seconds later, it remains nothing of you in this room. But this is not the end, it is only the begining. As soon as you started being dematerialised in real life, you got reconstructed atom per atom, ... or perhaps should I say "bit per bit" instead, in the vast memory of ENCOM cluster of mainframe computers. As soon as you appear, you are enslaved by the Master Control Program's cerbers and put in a numeric jail. Your destiny is to die in various games remaining the time of Roman Gladiators. Fortunately for you, the Master Control Program does not know that you are the nearest equivalent on earth of what could be called a god of video games, so you easily manage to escape from the light cycles arena and roam freely outside. So here is the situation: You are a user, prisoner of the numeric world, currently driving a fast moving light cycle, trying to survive, avoiding any collision with the computers subsystems and data, moving from one disc area to another in the hope of finaly defeating the Master Control Program and save all your friends still prisoners of the computer. You will be able to play this game on a real Oric Atmos, or using an emulator. then press RETURN/ENTER the message "SEARCHING" should appear in the status bar on the top of the screen. You can then press play on the tape player. After a while you should see "LOADING". 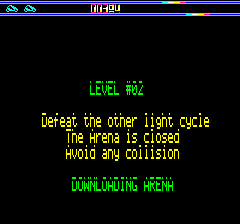 At the end of the loading, the game starts automaticaly. You are then required to enter your name. Sure, this is a secure computer system, so you have to log in. Just type your name using normal keys. You can also use LEFT and RIGHT arrows to move around, DEL will erase the current character, and the ESCAPE key will erase the whole text field that by default contains the "SIMPLE USER" name. This name will appear later in the highscore tables, so be sure to enter a name that will allows you to show everybody how good you are. Please note that you can also use the UP key on this screen to switch between the two available control modes. Two control modes ? Yes: 2 keys mode, and 4 keys mode. ENCOM early simulations showed that the human population is roughly splitted in two categories when things have to be moved on a screen. In the case of this simulation, it means that some people will be able to think as if they were currently driving the bike, and thus only need two keys. One will allow them to turn 90 degrees to their LEFT and the other one to turn in the other side. The other people, that happens to be the majority, will feel very uneasy with such a control method because they are outside, watching on a computer screen something that moves in a particular direction. For them the best control mode is the 4 keys one, where pressing UP, DOWN, LEFT or RIGHT will makes the light cycle move in the chosen direction. When the selection is done, just press RETURN/ENTER to validate the name and enter the game. From this moment you will be playing through a number of different levels, using the keys you chose to move your bike, and trying to survive and finish each level. You can press the P key to pause the game, and you can also press the ESCAPE key to exit the game and get back to the introduction. The objective of each level is clearly explained during the generation of each level. Each level is a combination of color schemes, obstacles, and game rules. Some levels have obstacles, some have none, some levels have a surrounding wall some don't have and wraps around in one or two directions. In some levels you are alone, in some there is a RED light cycle controled by the computer. 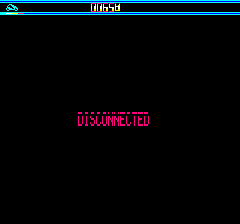 You start the game with a total of 3 lifes, you lose one after any collision, after three collisions, you are disconnected from the system and disappear for ever from the world. That's a sad way to disappear so stay awake ! 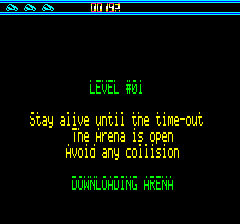 Please note that after each level the speed slightly increase. 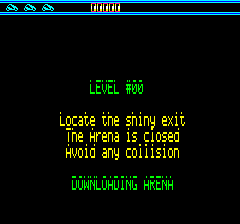 After the 8th level the game wraps around to level 0 with additional speed. 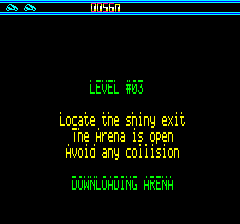 After each successfully finished level you got some bonus points. Try to ancipate your trajectories, and take opportunity of the fact you have three lifes, and that there is NO RANDOM event in this game. So you can try and experiment, after a while you should manage to go through all levels with no troubles.